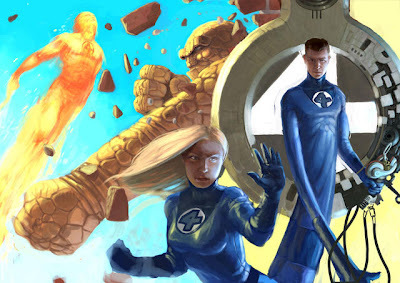 Whether this news was timed around the the recent news of Disney's acquisition of Marvel Entertainment or not, 20th Century Fox has confirmed they intend to reboot the "Fantastic Four" and have hired Akiva Goldsman to produce. Goldsman who has a long list of both produced and written films seems like a solid choice to helm a redo on the series. What is nice to hear is that Goldsman is not penning the script. Known for writing the craptastic Batman sequels Batman Forever and Batman & Robin probably didn't bode to well for Goldsman. I am being a tad harsh on him considering since then, he has wrote a few films I really did enjoy including A Beautiful Mind, which he won an Oscar for Best Adapted Screenplay in 2002. Akiva Goldsman is also currently producing "Jonah Hex" and "The Losers" two other DC comic book adaptations both for Warner Bros.
20th Century Fox has also tapped Michael Green to pen a script. Green had previously focused on television writing episodes for all four Smallville, Everwood, Heroes and Kings. Michael Green has most recently just finished writing a portion of the shooting script to "The Green Lantern" over at the WB with Martin Campbell attached to direct. After the announcements of Akiva Goldsman and Michael Green the Fantastic Four reboot details really begin to fade. 20th Century Fox refused to comment on exactly how the film will be approached. Considering the first two films were on the lighter side of comic book films made in the recent past, it could be safe to assume Fox will go the The Dark Knight route and take a darker approach to the series. If that is the case, it seems completely like the wrong move! The Fantastic Four have always been campy and I thought the films did a decent job of portraying that. Furthermore, much of the darkness in Nolan's Batman is still found at the core of the Batman character. Fantastic Four is a stark opposite to Batman when it comes to tone and depth. I read F4 as a kid for fun, Batman was serious and I treated it as such. One thing that is certain from 20th Century Fox's breaking news is that they intend to keep full film rights to the Marvel characters they currently hold rights to. Fox also hold film rights to Ghost Rider, Daredevil and X-Men outside of the Fantastic Four franchise including the Silver Surfer. The studio is currently in early stages of production on most of their Marvel character rights including a Ghost Rider sequel, 3 different X-Men films on top of a sequel to Wolverine not to mention there have also been rumblings of a re-try at Daredevil franchise.